"If I Only Knew" is an illustrated memoir of Ian's first 18 years. Written for the children, and perhaps friends and family, it may not be of much interest to strangers. There's not a lot of drama, not a lot happening, just a modest life beginning and unfolding. Most of the time, the stories and anecdotes that make up these 18 years are recounted rather than expressed. In short, let the reader beware! It is here on the web because it comes to about 200 pages in Word format, and includes just under 250 photographs from those years. Printing it, even somewhere like Kinko's (now FedEx Office), would cost over $100 a copy. Self-publishing in book format might cost less, but would involve much more work trying to master yet more software. There can be too much of a good thing!  Uploading it here has almost zero marginal cost. 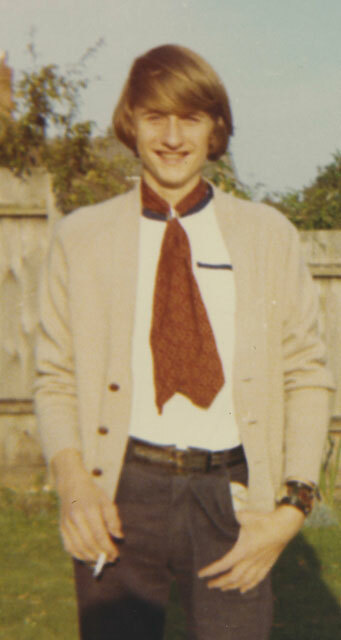 The photo above was taken in the back garden at home in England around 1969 when I was 16. Already one very bad habit is visible! The table of contents below gives a flavor of what is in each chapter of these memoirs. They are not strictly chronological, jumping back and forth in time within each theme. 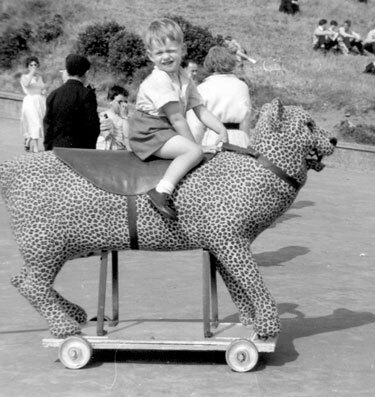 Embarking on that risky ride of life, on a leopard, no less! Chapter 1 “I Have a Photograph” An introduction. The line is Paul Simon's from Old friends/Bookends: "I have a photograph. Preserve your memories. They're all that's left you." How do you remember the past accurately? Chapter 2 What Mum and Dad Told Me. A rather miserable and colorless beginning. My birth in a pea-souper outside Slough. Dad's first affair and its consequences. Our family's unsung war hero, Uncle Ron. Sue arrives after we move to Cardiff. Chapter 3 Daily Life in a Small World. Moving house again, from Cardiff to Bristol. Hand washing laundry and Bill and Ben, Flowerpot Men, on the BBC. Counting the pennies and its consequences. Chapter 4 The English Riviera. To Paignton in South Devon with Henleaze Hockey Club, the "Bluebottles," each Easter. Driving down the A38. Mum is surprised by an admirer on the hockey team! Being King Canute as the tide comes in during a storm. Westerleigh Road School in Bristol. 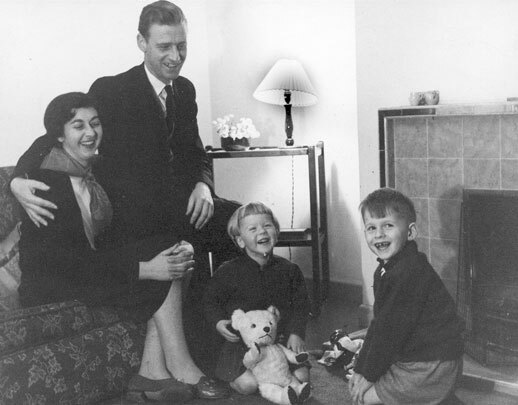 Mum, Dad, Sue and I in our first professional family portrait, taken in our living room on Amberly Close in Downend by the Bristol Evening Post in around 1961. Today, it hangs on our wall in the hallway. The trolley is still in use in Santa Cruz in 2008. We finally gave the settee (sofa) away a couple of years ago. Chapter 5 Home as a Pressure Cooker. Penny-pinching and early health problems. Gresley Pacifics at the home of Aunty Rose Ives (née Burrell) in Potter's Bar. "And I love you, love you, love you." Heinz baked beans and chocolate. Enlightened education: a visit to the Cadbury factory in Bournville! Bicycling from home in Downend to dad's office at Bristol Aircraft in Filton. And back. The plans they made to get me into trouble! Chapter 6 Success at School. Intelligence by diagnosis. A Bristol Britannia crashes in Downend. Small boys fight. Another move for the family, this time to the outskirts of Birmingham. Scholarship exams at age 11. A failed Hindustani lesson. Hooked on doing well at Haslucks Green County Primary School. Photos of a summer holiday in Ostende. From Wikipedia. (c) John Griffiths. 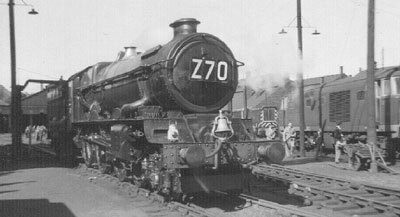 Ex GWR 4-6-0 Collett King class 6000 King George V at Swindon works, after working the last trip of a King from Wolverhampton Low Level and Bimingham Snow Hill. Probably late 1962. Chapter 7 Dad’s Career. Starting at LSE, studying under Laski and Nancy Seear, his tutor. Personnel Director for Rank Hovis McDougall in the Midlands. Building relationships, at home and with the unions. The Midlands Region of the TGWU, run by Alan Law. Mother's Pride, Hovis bread, and Mr. Kipling's "exceedingly good" cakes. Alex Jarrett at Reed International. Photos of dad's family and childhood. Chapter 8 Football. Football for small boys, with tennis balls on concrete. A winklepicker in the face. Sir Matt Busby's "holy trinity" at Manchester United: Law, Charlton and Best. A bully in Shirley park. Altruism and egotism on the field. Photos of mum's parents. 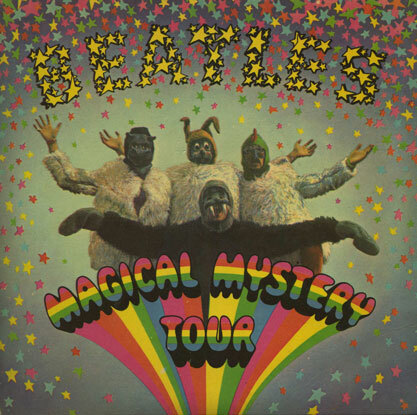 My "Magical Mystery Tour" EP, another classic from the Beatles. Chapter 9 Train spotting. A passion long gone: steam locomotives. Playing "last across" with Michael Palmer? Ian Allan's "Modern Railways." Obsessing about "Kings" on Birmingham Snow Hill station. Watching out for strange men. Bullies at Tyseley shed. Ultimate train spotting alone in 1964 all day in London. Such a lucky boy! 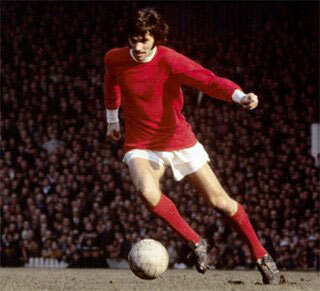 George Best, who played the beautiful game for Manchester United and Northern Ireland in his prime, and who made a generation of fans believe. Chapter 10 The Tough go Shopping. Mum's hobby. On a Midland Red double-decker bus to Rackham's and Lewis's department stores. Stress! Philosophy of shopping. Mum and I arguing. Chapter 11 “Summer Holiday." Sleeping car trains to Scotland. Pathogenic pairing? Climbing Ben Nevis. Big brother lording it over little sister? The beginnings of pop music. "The Young Ones." Cliff Richard and the Shadows convert a London bus into an RV. Chapter 12 “I’d Love to Turn You On." The Beatles! A Beatle Jacket. "Yeah yeah yeah!" The rich rattle their jewelry. The most perfect Christmas present in the world. Hammersmith Odeon, Boxing Day 1964. "She's Leaving Home." Beginning life in a colored world. "Hey, you've got to hide your love away!" 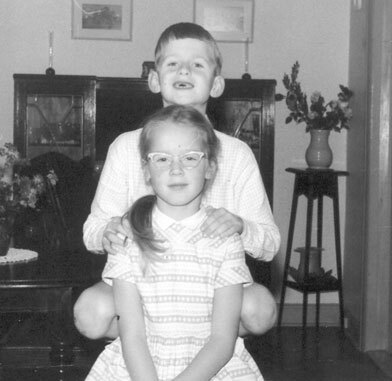 Sue and I when we lived on Skelcher Road in Shirley. Maybe this was taken in the next-door neighbor's house. Chapter 13 “Bye-bye Love.” Spin the bottle. "Bachelor Boy." Moving house again, and leaving girls behind. Red ants. Chapter 14 The Scholarship Boy. Solihull School, for boys only. Holiday in Benodet. Working so hard. "I bet Cranny got it!" Private school in England: call it "public school!" Billiards at Swatty's house. Reading out loud for Bogbrush. Playing rugby for the U13s. Winning at cross-country and public speaking. 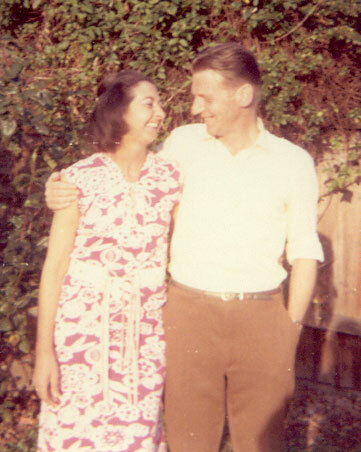 Mum and dad in the back garden at 18 South View Road in April 1970. They had been married for 21 years. Chapter 15 “(I Wish I Was) Homeward Bound.” Boarding: the biggest mistake we made. The Beach Boys: "I wanna go home, let me go home, why don't you let me go home . . . ? ” Simon & Garfunkel: "like emptiness and harmony I need someone to comfort me. Homeward bound, I wish I was homeward bound." A Stock doesn't quit. Cranny making radios in matchboxes. Simon Billing's cool joke. Praying for the children of Aberfan. Head Boy's fag. Dougal Mackay and I avoid a fight; Cranny and Billing regale in one. Feeling smaller and smaller. Hard boys. An accidental hole in the ceiling. Two ways to present buttocks. Bubbling in my ears. Not feeling anything anymore. Chapter 16 Catholicism Lapsing. More on dad, our affable atheist. "Openness to the unbidden." Sickness in his family. "You can't win them all." A careful moral education. Paul Robeson singing "Ol' Man River." A womanizing priest? Lacking a spiritual life. Father Gaffney's high speed high mass. "Bless me Father for I have sinned." Sunday mornings at Marlow Lock. 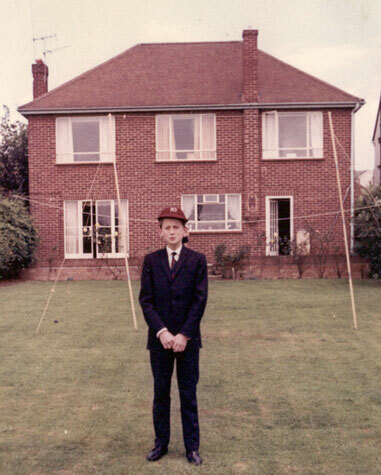 In my Solihull School uniform in the back garden at 18 South View Road, summer 1966. Chapter 17 “Gee but it’s Great to be Back Home!” 18 South View Road, Marlow, Bucks. A few random slaps from Great Marlow School. Sir Steve Redgrave, Olympic rower, and the 11+ exam. A "Teasmade" for mum and dad. Saturday morning shopping at Clark's the Butchers and for cartons of cigarettes. Kittens for Sue and me. Mum's third kidney sent packing. Morecambe and Wise on TV. My peak soccer moment. Summer holidays on the Adriatic. Rosella Bufundi cried! Dad's "Sunshine." Chapter 18 “Balls to Ernest Hazelton." Sir William Borlase's School, again for boys. "O" level exams and anomie. John Lennon on the effects of education. Bunsen burner as water pistol. The Monk. Playing pinball in the West Street Cafe. Smoker's Corner. Skiing on a stretcher. Burying Caesar or praising him? "Cool, so cool, cold as death!" 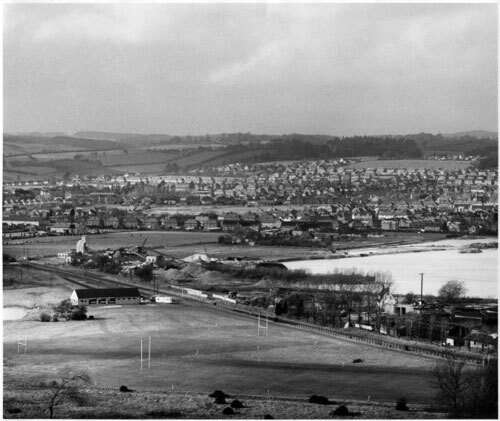 Marlow's eastern outskirts, with rugby pitches, the gravel pit, and the railway line to Bourne End in the foreground. Circa 1960. Photographer: Ronald Goodearl. Chapter 20 “Baby Driver.” My 17th birthday. The most perfect birthday present ever. MY Austin Mini. An unsuspecting world. Burning rubber on a country lane. Weaving through traffic. Plane spotting. Collective property. Wheelies on the runway at Heathrow. 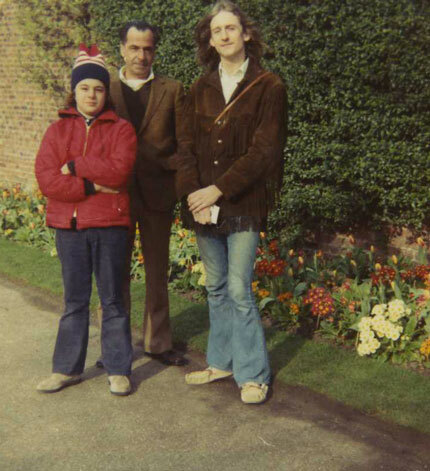 Will Roy, Paul and me in London, during the summer of 1970, when the Roys visited us for the second half of the Jean's and my high school exchange. Chapter 22 “Just let me hear some of that Rock and Roll Music.” Soundtrack of a teenage life. Our incredible music. The Nag's Head. The Stones in Hyde Park. The Dead in the Midlands. Led Zep at Bath. The Who play Tommy at the Isle of Wight: "right behind you, I see the millions." Riding the wave. Dumb anarchists and dead rock stars. David Milsom dancing. Adrian Wynne gesticulating. "Do bats scream?" The music never died. Chapter 23 “America.” The US seen from England. Entertainment and shameful tragedy. The Roys of Cambridge, New York. Johnny's in Hoosick Falls. Girls at school. Seeing stars! My first Big Mac. American frankness: "what a bod!" Warmth on a cold porch. Feelings first. Chapter 24 “Head out on the Highway.” "Hitchin' on the run-in, . . .". The Trans-Canada Highway. A mistake outside Thunder Bay. Pam and Dave and Children's Aid. No work. My Journal of the meandering trip back East. Changing my name. You can always leave. On the road again. Winter coming to Canada. Panhandling. "Pretty Flamingo." Making a mess of it. A birthday trip on a ferry. Gander. "Become yourself, because the past is just a good-bye." Chapter 25 “Can’t Help but Wonder Where I’m Bound.” Taking stock. The line is Tom Paxton's, a young hippy wondering.